I'm at the tail-end of pulling my website together but I clearly have a lot more to learn. Like most of you, I shoot in RAW and the final image sizes are huge. I am using a wordpress-themed website hosted by Bluehost, editing with Apple's Aperture for the time being. What are some of the most important how-to tips or best work flow advice I need be aware of so I do not crash my own site with large files? The last thing I tried was uploading maybe 200 images into my media library at 2MB each and then optimized them with EWWW but my site remains at a crawl. With NO content other than the theme Google PageSpeed Insights rates my site's speed at 50 out of 100. So something is up. At 2 Mb each file, that is monstrous and causing the 'crawl'. You should be in the 200-500kb range with 'Web-Sized' images around the 900-1200 pixels range for the 'long' side (ie: maximum width or depth at 1200 pixels depending on landscape or portrait mode) at 72 ppi (web browser native resolution). If you have the images full res in a folder, I duplicate them into another folder called 'Web Site Resolution' then I batch run an action (you need Photoshop) which will do a 'step' reduction, sharpen, reduction, sharpen a couple of times changing the Pixel Dimension on the long side to whatever I chose, say 1200 pixels, and it also reduces the actual Resolution for web viewing of 72 ppi. If you have Photoshop, I have attached my Wed Sizing actions (zipped) so you can use them, just pick you size you want. Then a dialogue box comes up, then choose the 'Action Set', then the actual action, make sure you choose the folder of the images you want, follow the diagram below. 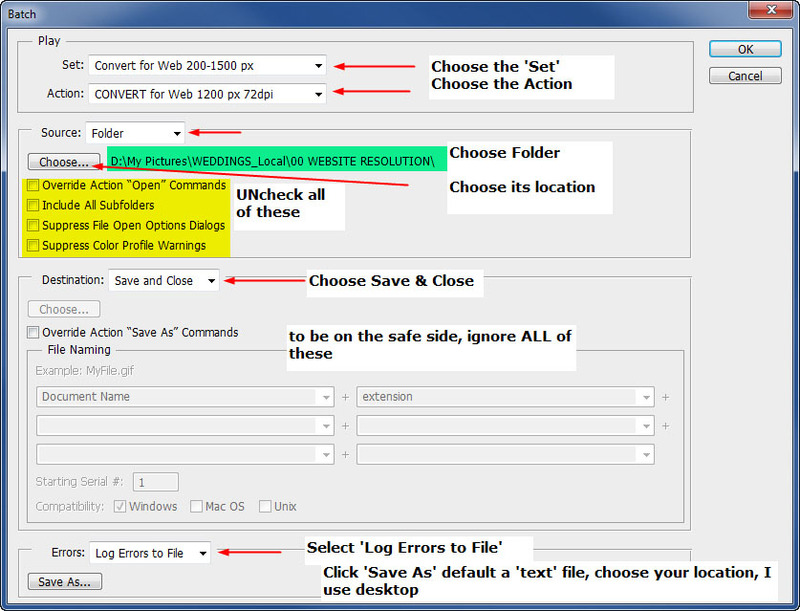 Just click on the 'zip' file to download the actions. If you know what you are doing with actions, get out of Button Mode, expand each action and turn on/off some of the sharpening, if not sharp enough, turn on some more, if too sharp, turn off 1-2 of the sharpening you see, up to you. In addition, if you buy some of the plugins from The Turning Gate you will also have web optimised galleries, client response galleries, galleries with carts with PayPal purchases etc. As Certacito says, I reccomend LR and if you need PS open the file direct from LR, work it in PS and "Save". It will go back to LR. You can export from LR and it's very easy to resize in "Export Module". You can make presets in export module. For example I made few presets and separate folders in my desktop: photos for website preset goes to photos for website folder, full res delivery goes to full res delivery folder, etc. 1000px for long edge should be good or 50-60%. I also like to resize the files for Facebook. If you don't, they will do it and sometime I don't like it. Good luck!